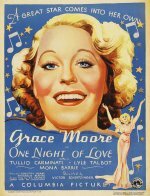 This is the hit movie that made a movie star out of the diva Grace Moore, and brought opera to a wide film-going public. Somewhat mirroring her own career, it told of an American soprano who studies in Italy and wins fame at the Met. The director Victor Schertzinger, an accomplished musician, co-wrote the title song, which Moore sang among four operatic arias.